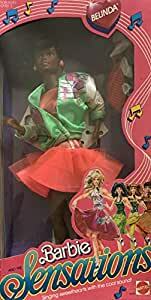 Barbie and The Sensations Belinda Doll is a 1987 Mattel Hawthorne production. INCLUDES: an Ethnic AA Afro American BELINDA DOLL. Doll wears orange Finger Ring, a pair of orange, purple & green musical notes Earrings, a Dress w/shimmery orange top w/dropped waist & flared orange skirt w/orange tulle overskirt, a green Jacket w/white sleeves & glittery green neckline, cuffs & waistband w/shimmery purple, silver & orange musical decal on either front side, & comes w/white Socks, a pair of white & black Saddle Shoes, an orange Hair Brush, a Microphone, & Sun Glasses. GREAT for your Collection, for Personal Use – Fun Play, as a Gift, for Display or Diorama, for Artwork or Decorative, or for Whatever YOU Prefer. For Ages 3+ Years. All colors, sizes & description details are provided to the best of my ability & may not be exact & may vary. (All Sizes are Approximate). *NEW. Box has light edge/corner rubs, & plastic has small dings near fold. For BOX CONDITION and More Information please EMAIL SELLER for Details.